By now, if you have been following my blog posts visiting the 5 National Parks in Utah, you know that not all Parks have one area of interest. Overall, Zion appears to be the most visited and therefore crowded. 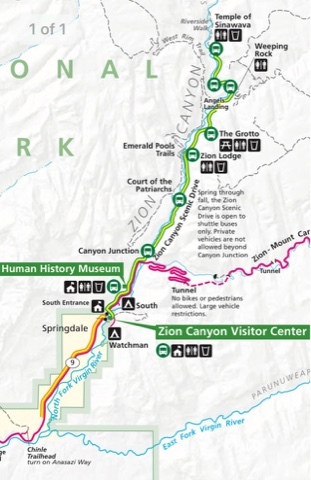 The primary reason for the crowds is that Zion is close to I15 between Las Vegas and Salt Lake City, with a lot of services in the area. The other 4 national parks in Utah are a much longer drive with less services. In coming to the park please set your expectation that it may be crowded and take extra time to get around. 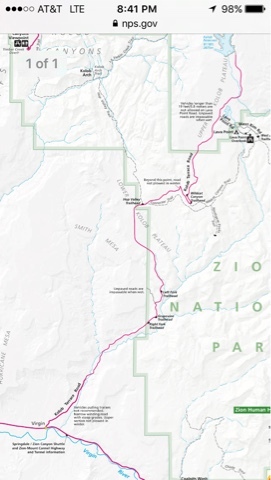 Zion has 5 areas and each are interesting in their own way. The East Side is where I entered the Park from Bryce Canton. First you see many trees at this higher elevation but as you get into the park you find many bald hills and mountains with little to no vegetation. I actually like this section of the park as you can drive it but turnouts for parking are very limited. You can drive east/ west and west east in the park but parking along side the road fills by 10:00 am. The east side trail at the tunnel entrance that connects the east to the vslley only has 6 parking spaces. During this and last year the parking was full as I west by both years. By 10:00 the visitors Center Parkibg is full along with smaller adjacent lots. You are then expected to park outside the park, roadside in the small town of Springdale. There you can get a free shuttle ride on the bus to the park's pediatrician entrance. Don't pay the $15 or $20 a day to park, that some private parking areas ask for. I parked at the end of the bus line and rode in the approx 3 miles and got dropped off at the entrance for no cost. The valley of the park is only serviced with park busses. During busy times you may have to wait for a few busses to pass before you get a spot. I was there in one of the spring break weeks and some wait time was necessary. 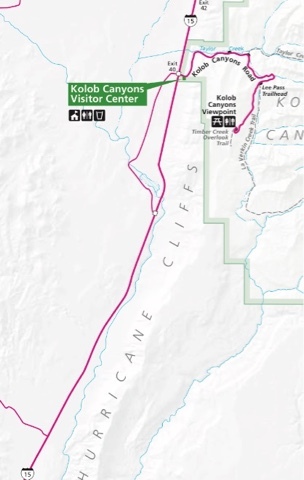 Outside the park's entrance between the towns of Springdale and Hurricane is Kolob Terrace Road. The name can imply a road into a housing development but the terrace is miles up into the national park and private land. In fact the road terminates at a reservoir that my Prius could not get past the cattle guard at the entrance to the reservoir due to droppffs on either side of the cattle guard. This is after driving through snow tracks that others had worn on the road that were one lane only due to left over snow and no plowing. The national park entrance up there was unaccessible as it was still snow covered. There is a piece of the park that is directly adjacent to I15 about 30 miles beyond the lower exit for the Springdale entrance. Here you find a dead end road with some hefty hikes if you are into backcountry hiking. There is one hike at the end of the road that is nice and family oriented. Zion is noted for the "Narrows", that section of the park where the river enters and it is so narrow that the road doesn't go there. Many shops downtown sell neoprene boots, socks, bib pants, walking sticks, etc for your pleasure to make your way across and up river to where the canyon is all river side to side in the canyons. I have not done this, but looks interesting. Note, you must be weather smart as people have died in the narrows due to flash floods. 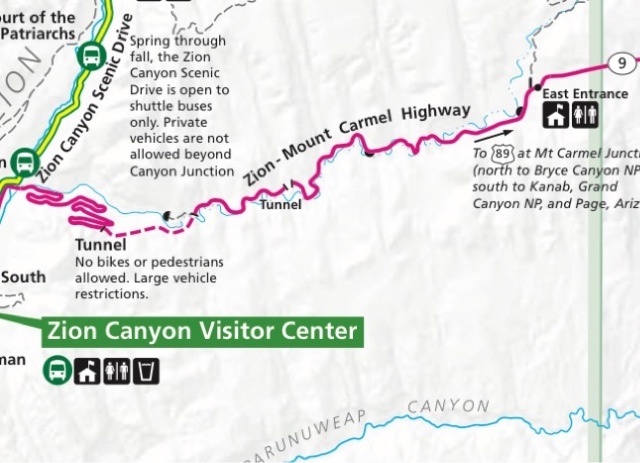 These canyons that feed the narrows start way up north so although the sky's near you in the valley are sunny rain further north can get you and your family. Just make sure that it is a day with no rain anywhere around. This park is beautiful with such high cliffs but is my least favorite due to crowds. 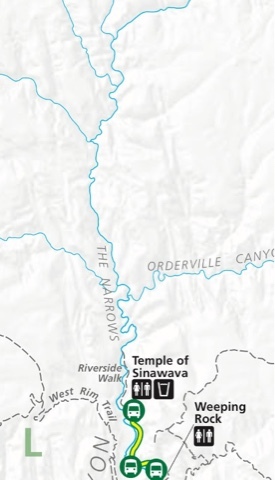 All the maps included here were edited from the Online National Park PDF file. I am thinking of dwelling in a Prius. I would like to learn a little more. Let's say it is daytime. You are in the grocery store and your Prius is in the parking lot. People are walking past your car all the time. When somebody walks past your car and looks through a window, would they sense that you live in it? For example, could they see your bed? Or is it stealthed during the day? Thanks and your welcome to to ask any questions you wish. If you wish to take them offline you can email me. Your question touches on stealthing in the Prius. There are many aspects to stealth but I will address only your specific question here. My first year I was overly cautious about people seeing that I was living in my Prius, so I took precautions to not show that I was living in it. This year I am less worried about it in general public areas but still stay concerned in places where I plan to spend the night. Specifically, I do at times close my black curtains in the rear not to show the back of my car. I can close the side window curtains from the fronts seat. I then open the rear drivers door and close the rear curtain and that may be enough. Since I have street legal tint the combination of tint and light weight black curtains works well. Doing this curtain closing does add to the heat inside the vehicle. At Walmart I may close the curtains if I plan to stay their lot later and if I'm shopping I park out where the remote carriage return is and there is a waste recepticle. When I come out of the store I get rid of all packaging on products and even repackage to ziplock bags as I have no room for trash later and putting in ziplock containers helps save space. Since I do this in the parking lot I usually can do this from the rear hatch and manage what people see. Plus you are doing this away from where most people park. My tint is generally sufficient to not have people see in very well and with my black coats on my sleeping bag there isn't much attraction. Others I know cover their sleeping bag with a black sheet to keep it dark inside their car. There is no 100% stealth but the Prius is not an attraction if tinted and you keep the inside dark too.